It’s no longer enough just to convert—to stay competitive, you need to turn prospects into lifelong fans of your brand. But with commerce channels and buying behavior changing so fast, we all know that’s easier said than done. What were once communications channels are now becoming commerce channels, with consumers making purchases on their TVs, on Twitter, and by text message. 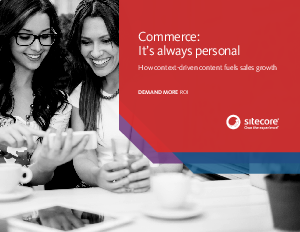 In the past, commerce and content data and experiences sat in their own silos. Those days are gone.